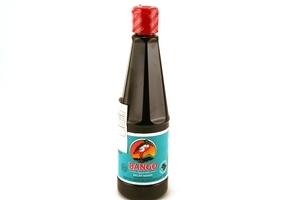 Bango Sweet Soy Sauce (Kecap Manis Cap Bango) in 10.56oz (300ml) plastic bottle. Bango stands for taste of genuineness, which is refrected in its genuine soya sauce taste because it is made of high quality black soya bean. Perfect for Marinated Indonesian Satay With Bango Sweet Soy Sauce. No MSG. Bango Brand Since 1928. Product of Indonesia. Halal Certified حلال . For Kecap Bango, the product quality is always of the highest priority. Its made purely from selected high quality ingredients: black soy beans, coconut sugar, salt and water without any preservative or additional chemical ingredients. The black soy beans are fermented for several months to be nicely mixed in a special process with other ingredients to give the special taste that makes Kecap Bango different from others whom used yellow soy bean.